Cinderella Song Lyrics Lavender's Blue, Free! Cinderella song lyrics and sheet music "Lavender's Blue", free! The vocals with piano accompaniment now come in six different keys. This pretty lullaby featured in Cinderella (2015) is actually a very old song from England. To my surprise, it was the #1 MOST POPULAR SONG that I gave my vocalists and younger pianists a couple of years ago - I knew it was a charming, simple melody, but apparently it has something extra going for it! Beginners (girls) still love it, and I always give it to them in the first few months. Here are easy piano music sheets for beginners of the lullaby in the new Cinderella movie, with left hand chords, in four different keys to choose from. Although the Cinderella song Lavender's Blue is still pretty with only 3 chords - the I, IV, and V chords - there's a bit more depth of feeling when you incorporate some secondary chords. Good practice for young players to get away from the I-IV-V7 construction, too! Below is a graphic of one of the lead sheets, also with the traditional Lavender's Blue lyrics, (which just happen to be the Cinderella song lyrics as well)! There are lead sheets in four keys. This easy lullaby, with its stretch of only six notes, is just right for beginning piano players, singers, and other instrumentalists. I OFTEN give this to young beginners who are still in the "black notes" stage, as long as they can identify notes. Using my own left hand as the model, I encourage a student to take HER left hand and play an OPEN C chord (just C & G without the middle of the chord) in measures 1 and 2. Then, when it's time for the F chord, sneak the left hand down to that chord using the C (the one her "pinky" finger was just pressing in the C chord) as a marker. Instead of finger 5, now finger 1 is on the C, and pinky (finger 5) is on F.
When it is time to come back up to the C chord, sneak again. As for the G chord, use a G pinch (G and F pressed together with 1 and 2). I tried this with a little girl today and she was even able to close her eyes and sneak from chord to chord! 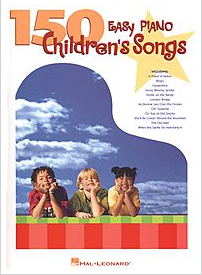 Even though this is, really, a nursery song, it is very appealing and fun to sing. However, the easy piano arrangements above are not lively enough for a singing performance, in my opinion! I've arranged a simple accompaniment that is very pretty and bit more like the audio from the Lily James Cinderella. My arrangement includes the melody line, as beginning singers usually need this support. This arrangement comes in six keys, and is for sale, all six keys for $5.00, with the right of unlimited printing FOR YOUR STUDENTS ONLY. This lovely song is IDEAL for beginning singers. The melody spans only six steps, and repeats frequently, with easy intervals. A good reason to have it in multiple keys. The interlude in-between each two verses keeps it feeling fresh. Tell young girls that THIS is the song Cinderella was singing, high up in the attic where her stepmother had imprisoned her, when the Prince was searching for her. Because he heard her singing far above, he was able to rescue her! They will be SOLD. But also show them the movie trailer video at the bottom of this page, followed by a portion of the video above. You will see some wide eyes! All my singers have loved this piece. So why should you buy this music from me, aside from the fact that music stores on and off-line will charge more for just one copy (not counting postage or sales tax! ), while I am only charging $5.00 for the right to print unlimited copies (for your students only)? It is available immediately as a digital download onto your computer. You don't have to download any new software into your computer in order to download this PDF. I don't know about you, but I hate clogging up my computer with yet another program I didn't know I needed. You just need a version of Adobe Acrobat or another PDF reader, which all computers come with. If you DON'T have Adobe Acrobat or a similar program, then you couldn't download any of my other PDFs either. The notes and lyrics are a little bigger than the copies currently available in music stores, making reading easier! Speaking of reading the music, you can print this music on any kind of paper you want, and thus avoid the glare of shiny pages (so irritating for accompanists!). Write and make notes all over these copies, in red and other colors, without feeling you are spoiling your music for posterity. I dislike messing up my music books, but learning the piece is always the first priority. These printouts will make great working copies. Do you need a letter of permission in order to use this music at a competition? Write me through the Contact Me form, and I will email you a personal letter. I give you permission to make unlimited copies legally. When you need music, you usually need it NOW. Your accompanist, your soloist-student... let them have this music without fear of copyright infringement. Paypal, the payment system I use, is a secure and recognized payment system. You can pay by credit or debit card, or your bank account. E-Junkie delivers the PDF document, working as a partner with PayPal...your purchase is guaranteed. Problems downloading? Write me personally through the Contact Me link, and I will take care of it promptly. I am truly loving this movie, although Ever After - A Cinderella Story is really my favorite of all the Cinderella versions. Egyptian Dance - not as hard as it sounds! Very mysterious & beautiful. I'm a Pirate - a good song for young boys! Several settings. Irish Wedding (easy version) - all my students want to play this high-energy song! Kum Ba Yah - very pretty and easy - just 6 notes. Lavender's Blue - young girls love this music, especially if they have seen Lily James' Cinderella! Twinkle Twinkle Little Star - simple or even beautiful, depending on the accompaniment. Very useful for learning chords & transposition. Winds in the Willow - scale practice disguised as a mysterious, pretty minor melody. Thank you so much for all the information and materials! Your site is very thorough and well organized! 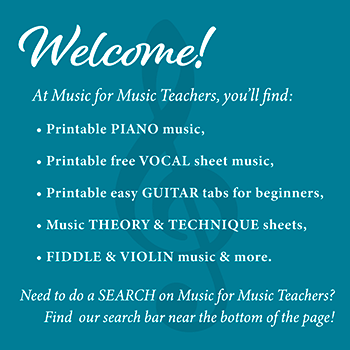 I am a piano teacher in New Orleans, LA and in the process of putting together my own curriculum and recordings. You have inspired me to make my materials available to all online! I just purchased O Holy Night to use as a duet for Christmas Eve Mass. Thank you so much for this simple, easy to read version as my vocalists are not professional and this music won't be quite so intimidating as other arrangements I have. Your expertise is much appreciated!! Merry Christmas!